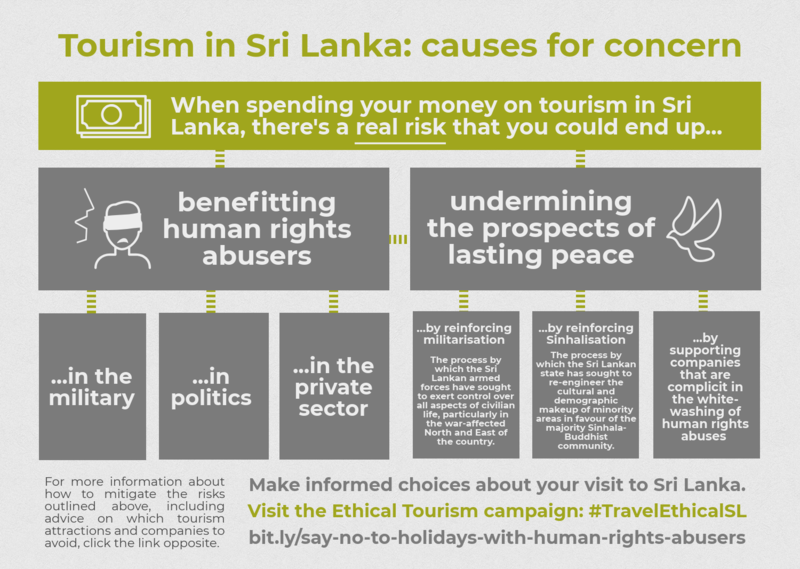 We are pleased to announce the re-launch of our Ethical Tourism Campaign, a resource pack designed to help those visiting Sri Lanka make informed choices about the human rights impacts of their travel spending. In it, we flag a range of tourism companies which we believe pose ethical concerns, including (but not limited to) dozens of hotels, restaurants and attractions that continue to be run by the military and other individuals linked to human rights abuses. The resource pack – which is both available online and as a report – also contains advice about ethical alternatives, as well as useful information about visiting war-affected areas. 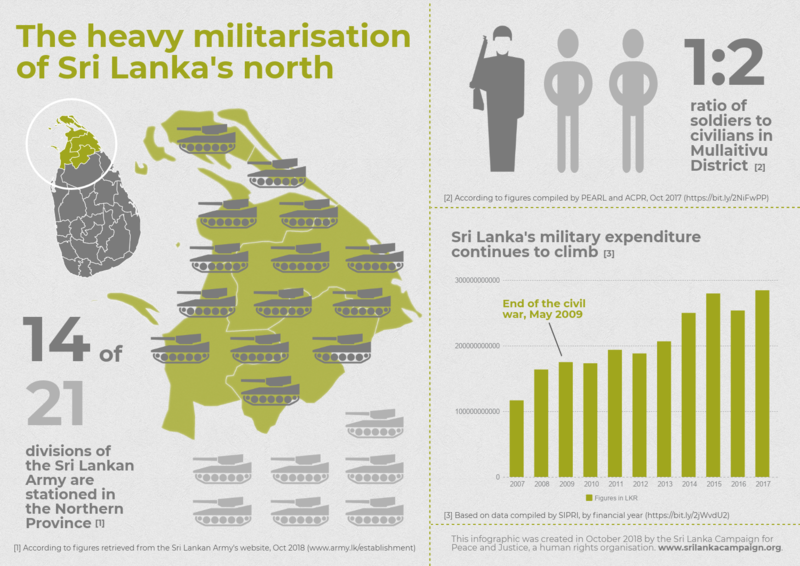 Our latest findings, diligently compiled by a Sri Lanka Campaign volunteer, underscore the alarming breadth and depth of militarisation in Sri Lanka nearly a decade after the end of the armed conflict. Despite commitments by the current government to reduce the military’s footprint, our database of companies to avoid has sadly only continued to grow. The Sri Lankan military are implicated in some of the most appalling atrocities this side of the millennium. Multiple UN investigations have documented how, as the war came to an end in 2009, tens of thousands of civilians were slaughtered by government shelling as they gathered in designated ‘humanitarian zones’. To this day, no one has been held accountable for these crimes – nor the litany of grave human rights violations, including torture, disappearances and extra-judicial killings carried out in the post-war period, largely against members of the Tamil minority. We believe it is the duty of the ethical traveller to ensure that the military, and other companies linked to human rights abusers, are not supported. This is not simply a question of paying due regard to the crimes of the past. 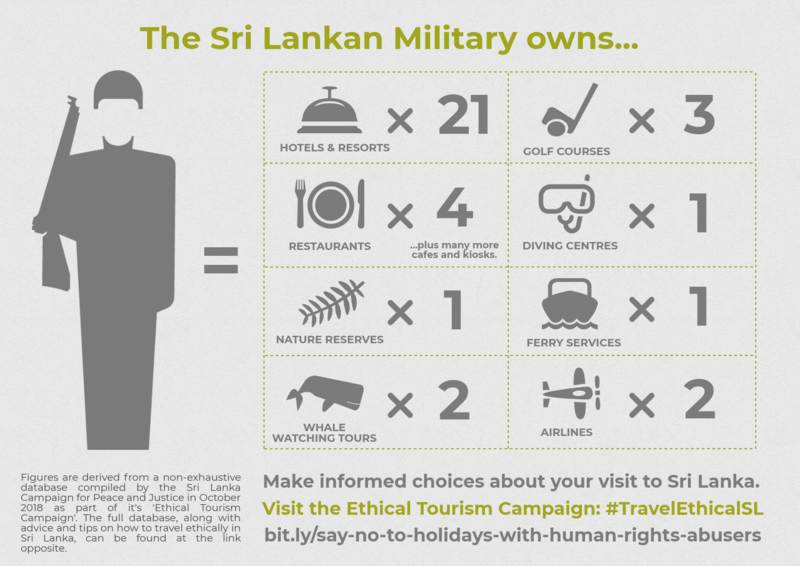 As we highlight in the infographic below, unaware traveller’s run a real risk of not only assisting individuals who should be brought to justice, but also of undermining the prospects of lasting peace in Sri Lanka. While we don’t think anyone should take the decision to visit Sri Lanka lightly, the good news is that, with careful thought and planning, visitors to Sri Lanka have the power to avoid doing harm. Indeed, we believe that by becoming informed about the situation and engaging with the struggles of ordinary people who live there, there are ways in which outsiders can play a positive and productive role. We don’t advocate for a boycott of travel to Sri Lanka. Nor do we claim that any particular trip is ‘ethical’ or ‘unethical’. In compiling these resources, our aim is to enable you, the tourist, make informed ethical choices of your own. Please help us spread the word by sharing this campaign with a friend today – or by re-posting our latest infographics on social media using the hashtag #TravelEthicalSL. Click here to access the resource pack. Click here to access the PDF report version. p.s. see anything missing from our suggested list of companies to avoid? Please drop us a line by email and let us know.